Florence is marvelous place and I can’t wait to share information and tips about it together with my blogger-friends! I asked my fellow bloggers to share their favorite spots in the city to compile this list of Florence top 10 tips by local experts! For my tips to spend one day in Florence as a local read there. My fist answer would be Sant’Ambrogio market, as it’s my ideal market, with local fruit and vegetables and a broad choice of meat and fish. But thinking about it for a second, I must say that I left my heart at the Mercato delle Cure. When Tommaso lived in Florence, I used to spend a few days a week there and I would walk to that market in the morning. This is where for the first time I felt as a local, where I learnt all the secrets of a good minestrone just eavesdropping the chats among vendor and clients, where I bought the most amazing porcini for a rewarding lunch. Giulia is the owner of the food blog Jul’s Kitchen, together with Tommaso. They organize cooking classes in their studio in Tuscany. My favorite place is Santo Spirito; this is the place I recommend to all my friends coming for the first time to Florence. The Church of Santo Spirito is extremely fascinating with its simple yellow, but elegant façade. The area of Santo Spirito is in Oltrarno, i.e. on other side of the Arno, that is actually the most Florentine and lively borough of Florence. It’s just perfect for any time of the day: from breakfast to aperitivo at Il Santino, from lunch to gelato at La Sorbetteria. This is just the place to feel like a Florentine. Ilaria is the owner of foodie FlorenceBuzz with Kristina and travel TuscanyBuzz with Ilaria. To know the last food trends, openings and best events follow their Facebook Page. My favorite for tradition, steak and soul is Ristorante Fagioli, for the respect to Italian cuisine and materie prime (raw ingredients, materials), Club Culinario Da Osvaldo. At Fagioli order Bistecca Fiorentina or the Filetto (the butter of tenderloin!) and the taccole. At Club Culinario da Osvaldo order anything they do with truffles, their cheese and meat boards and the rabbit! Coral is the owner of gourmet blog Curious Appetite. She organizes gourmet tours for foodies in Florence and beyond. Regarding aperitivo there are so many places that seem to really shine when it comes to mixing drinks. Florence has come a long way in the world of cocktails and I’m thrilled to be here to experience (as in drink) it all with friends. When I’m craving a cocktail, I don’t really have a “favorite” but I do go quite often for a drink at Ditta Artigianale on Via dello Sprone, where bartenders Natalia Mazzilli and Kareem constantly impress me with their craft cocktail flair. For a fancy drink, I tend to go to either Florian Firenze for Moscow mules and a classy — yet cozy ambiance or the hip contemporary bar at Irene Firenze in Piazza della Repubblica. Just ask Dario to whip you up a Cardinale and soak in the beautiful atmosphere. When it comes to wine bars, a glass of Franciacorta at Enoteca Pitti Gola e Cantina and their cheese plate is practically nirvana, just make sure to reserve a spot as tables fill up fast in the evening. 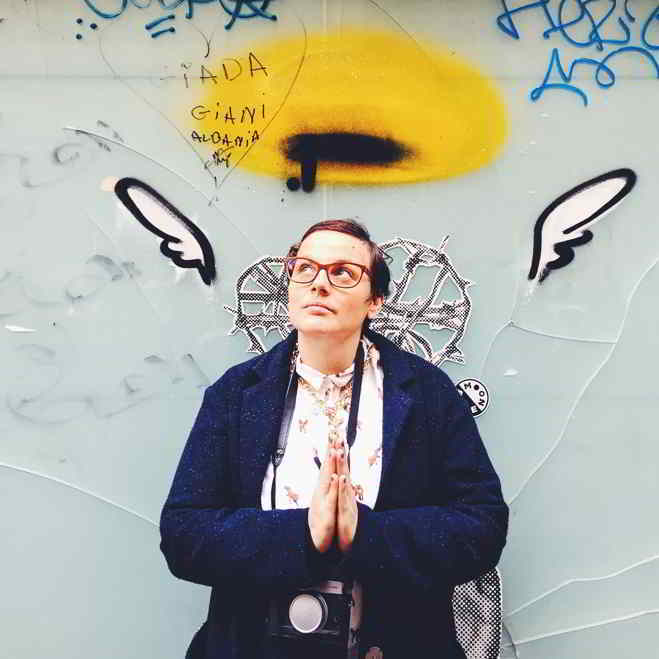 Georgette is the owner of famous travel blog Girl in Florence. For daily updates about Florence you must follow her Instagram account. People always ask me what my favourite museum in Florence is, and that’s a hard question because unfortunately our city doesn’t make the best museum experiences, despite the quality of their content being so high. But that said… What makes a great museum for me is where i feel a sense of peace. And although I tend more towards painting, perhaps my favourite museums in Florence are actually more about sculpture! The new Opera del Duomo is GREAT. But to name a classic, how about the Bargello? I love it in the off season. Visit in the middle of the winter and you can sit down in front of Michelangelo’s Bacchus and marvel at how he managed to make marble look like vulnerable flesh, when he was barely an adult. The museum also houses some great Donatellos, and some decorative works that I love. I particularly like the maiolica room, which many people ignore (even more reason to go in there). Alexandra is the owner of art & travel blog Arttrav. Her blog is a must-reading for all art and culture lovers. If I am only allowed to choose only one spot, it has to be Piazza della Passera. It is not a place, where you would love at the first sight. In fact, I didn’t think it was special at all the first time I was there. My fondness for Piazza della Passera grows after I started living in Florence. I find it a very characteristic spot surrounded by the old walls and antique neighborhoods, and even though it is only one block away from Palazzo Pitti, this little square still keeps that local and authentic vibe so well. I also love the fact that there are so many interesting dining places around Piazza della Passera. Many times I’ve brought my friends visiting from Asia to this square, either for a meal of typical Florentine food, or for a catch-up over coffee and/or gelato. And that’s how I realized: “Oh, wait a minute! Maybe I’ve unconsciously fell in love with this place!“. Last summer, a little temporary exhibition on the wall in Piazza della Passera. Passed by after a morning coffee together with Georgette (@girlinflorence). Sasha is the owner of stylish expat blog Stai al Borgo. Check out her Instagram account for beautiful pictures about life in and out Florence. One of the most beautiful and fascinating shopping places in Florence is the Officina di Santa Maria Novella. The most appealing fact about it is that you are about to visit a really old and authentic place located inside a 14th century convent. I think everybody knows about these fragrances, that are just the perfect present for you beloved ones – by the way, my favorite one is Acqua di Colonia Melograno! The home fragrances, especially the pot pourri – everyone living in Florence has had al least one of them! – the candles, the liqueurs and the ancient preparations are to die for. You really should try the energizing Acqua Antisterica, a small bottle with a perfumed water with a marvelous fragrance of mint and cinnamon, that is great at summer: just put some drops on your wrists for instant relief! The original formula was created in 1614, and many generations of Florentine ladies have successfully used it. The surrounding area is so lovely to wander, and it’s filled with small shops, artisans and most of all many nice foodie stops. Have fun exploring! Cristina is the owner of fashion and shopping blog Cristina Ferro Personal Shopping. She is a recommended personal shopper and image consultant. My favourite place in Florence is San Miniato, from where we have a fabulous view of the city! Denya is the owner of Brazilian blog about Italy Grazie a te. Her blog is a fantastic resource for Brazilians visiting Italy. If you’d like to tell a story with your pictures, well Florence is the right place. Every corner, every street, piazza and market offer unique colors, moments and stories to take pictures of. Florence famous skyline, together with major monuments and museums are, of course, the most portrayed in pictures. What I like the most in Florence, the area that most attracts me and my camera with its infinite details and beauty, it’s the Oltrarno. I love walk around San Frediano and Santo Spirito: in these boroughs you live the authentic soul of Florence, just pure poetry to my eyes. The best moment to take pictures and capture the infinite details of this side of the Arno are early morning and right before sunset, when the light enhance the warm colors of the buildings and the silent courtyards. Via dei Serragli is probably my favourite street to portray: it’s a long street offering different point of views, hidden gardens, characteristic doors, historic shops and many different people. Mattia is the owner of the photography blog about Florence La Mia Firenze. His most famous photo project is “Fermo Imagine” where he takes a black&white picture of Florence and takes it back to life. My favourite place to instagram is Ponte Santa Trinita. This bridge is full of details and stories to portray. Just stop there for a few minutes and keep your eyes open and your phone ready: if you’re lucky enough you can spot a newly-wed bride with a colorful bouquet, lovers kissing, painted bikes going back home, tourists lost watching Ponte Vecchio in front of them, artists painting and friends chatting. Ponte Santa Trinita rewards you with pictures that tell stories. Valentina is the owner of lifestyle blog Valina Postit. She has a very creative Instagram account that you should follow! Florence is definitively toomuch to see and to experience. I have toomuch places on my top list but I’d like to suggest to climb up to Giardino Bardini and get overwhelmed by the beauty of Florence! Thanks to all my friends and colleagues for these precious tips. See you around! Thank you so much Denya for your great tip and picture! Grazie a te Vale. Adoro la tua tip! Arduous climb, fantastic view! San Miniato also boasts an incredible necropolis that shouldn’t be missed…not to mention the beautiful old basilica itself!